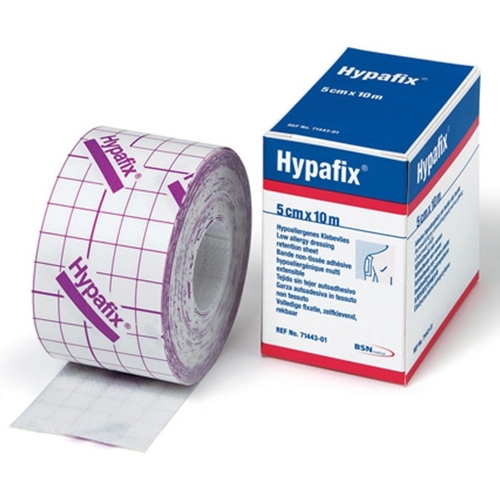 Hypafix Dressing Retention Tape from HealthyKin.com is a low allergy adhesive, non woven dressing retention sheet. Hypafix has excellent conformability that simplifies shaping around joints and awkward body contours, to allow the patient greater freedom of body movement. Complete coverage of the dressing reduces the risks of casual contamination. The broad range of sizes increases convenience and patient comfort. Great tape! Easy to measure and cut. Sticks to skin very well, conforms to uneven surfaces and removes without difficulty. So far, the best I've found. I am very happy with this tape. It is the least irritating of all other tape I have used. And I have to use it often to cover a chronic rash on my hand. I have been using this tape for a few years now , to help keep my insulin pump in place. It works great - very sticky/tacky. Doesn't do to well sometimes when it gets wet. When applying the tape, you must make sure not to have any creases. That's how the water gets under the tape and causes it to peel away from the skin. The tape does sometimes give me a skin rash. With some polysporin and a few days, it is usually gone. I have tried a few other tapes, but not been able to find one that sticks as well. I do home health care and this is the only tape that I have found to stick to my clients skin without skin prep. I love this tape. I am a RN and started using this tape for my patients that had allergies to tape. My sister was one of them. Now that I have to use tape everyday and change it every other day, regular tape made skin red and would break my skin open sores. I use HYPAFIX only. I use this tape on all my family for any kind of wounds. LOVE THIS TAPE. Super adhesive and great for difficult places. I have been using this for 20 some year. That should say volumes of how excellent this product is!!!!! !